Alloy multipliers for mild steel, copper, brass, and lead are incorporated into the instrument. The multiplier is selected using a switch on the front panel of the instrument. 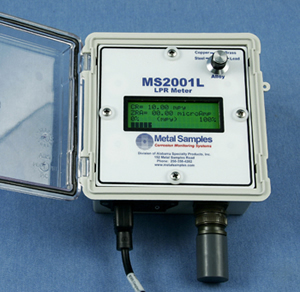 The MS2001L also offers a high precision zero resistance ammeter (ZRA) for measuring the electrochemical current between electrodes. This function may be used to measure the galvanic current between electrodes of dissimilar alloys. The instrument is housed in a NEMA-4X enclosure, making the MS2001L suitable for use in almost any indoor or outdoor environment.